ONE OF DAVE PICKEREL'S LAST BARRELS. 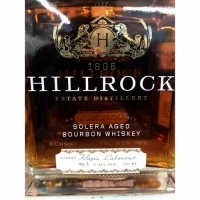 Hillrock Bourbon is the only Solera aged Bourbon in the market. It is made by Master distiller Dave Pickerell. Too many that would be enough to purchase this Bourbon. For those of you not in the "know," Dave Pickerell is the Master Distiller for Whistle Pig. Whistle Pig is considered one of the finer Bourbons and can cost over $500 a bottle. Now you're in the "know. " Hillrock is his personal brand of Bourbon. So, what is a "Solera?" A solera is a stack of barrels where a small portion of whiskey is removed periodically and new whiskey is added. You never fully empty a barrel. This allows the whiskey to age and gain complexity. Then it was aged in a Napa Cabernet Barrel for more complexity and flavor. The full-bodied palate opens with rich notes of brown sugar, molasses and toffee, followed by roasted corn, clove, cinnamon and a touch of spicy rye. Oloroso Sherry notes of walnut, fig and candied fruit merge with caramel and butterscotch on the long-balanced finish. 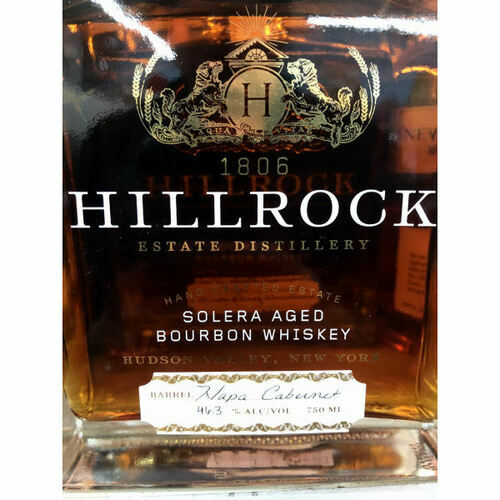 Current average age of the Hillrock Solera Bourbon is over 6 years and is one of the most awarded American whiskeys available.